Father Jacob (Netsvetov) of Alaska was born of pious parents in 1802 on Atka Island, Alaska. His father, Yegor Vasil’evich Netsvetov was a Russian from Tobolsk. His mother, Maria Alekseevna, was an Aleut from Atka island. Yegor and Maria had four children who survived infancy; Jacob was the first born, followed by Osip (Joseph), Elena, and Antony. Yegor and Maria were devoted to their children and, though of meager means, did all they could to provide them with the education which would help them in this life as well as in the life to come. Osip and Antony were eventually able to study at the St Petersburg Naval Academy in Russia, becoming a naval officer and a shipbuilder, respectively. Their sister, Elena, married a successful and respected clerk for the Russian-American Company. But Jacob yearned for a different kind of success, a success that the world might consider failure for “the righteous live forever, their reward is with the Lord” (Wis. Sol. 5:15). And so, when the family moved to Irkutsk in 1823, Jacob enrolled in the Irkutsk Theological Seminary and placed all his hope in Christ by seeking first the Kingdom of God (Mt. 6:33). Jacob was tonsured as a Subdeacon on October 1, 1825. He married a Russian woman (perhaps also a Creole) named Anna Simeonovna, and in 1826 graduated from the Seminary with certificates in history and theology. On October 31, 1826, he was ordained to the Holy Diaconate and assigned to serve the altar of the Holy Trinity-St Peter Church in Irkutsk. Two years later, on March 4, 1828, Archbishop Michael, who had earlier ordained Father John Veniaminov (St Innocent), elevated the godly deacon Jacob to the Holy Priesthood. This, however, was no ordinary ordination. As if he were a new Patrick, hearing the mystical call of his distant flock, Father Jacob yearned to return to his native Alaska. And the all-good God, who “satisfies the longing soul and fills the hungry soul with goodness” (Ps.107:9) heard the prayer of his servant. 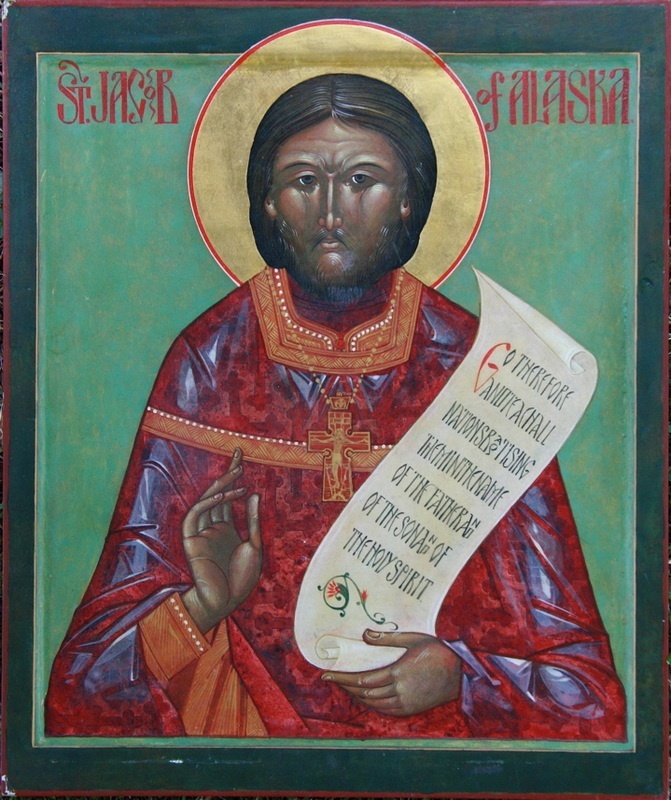 Archbishop Michael provided Father Jacob with two antimensia: one for the new Church which would be dedicated to the glory of God in honor of St Nicholas the Wonderworker in Atka, and one to be used for missionary activity. On May 1, 1828 a molieben for travelers was served, and Father Jacob, his father, Yegor, (now tonsured as reader for the Atka Church), and his matushka, Anna, set out for Alaska. Who can tell of the perils and trials associated with such a journey? Travel in those days was never easy, either overland or over the waves of the sea. Nevertheless, aided by prayer and confidence in God’s providence, the Netsvetov family arrived safely in Atka over a year later, on June 15, 1829. The new assignment for the newly-ordained Father Jacob would also prove to be quite a challenge. The Atka “parish” comprised a territory stretching for nearly 2,000 miles and included Amchitka, Attu, Copper, Bering and Kurile Islands. But this did not deter the godly young priest, for when he was clothed in the garments of the Priesthood, he was found to be “clad with zeal as a cloak’ (Is. 59:17), and so he threw himself wholly into his sacred ministry. His deep love for God and for his flock was evident in everything that he did. Both in Atka and in the distant villages and settlements which he visited, Father Jacob offered himself as a “living sacrifice” (Rom 12:1). Having “no worry about his life” (Mt. 6:25 ff), the holy one endured manifold tortures of cold, wet, wind, illness, hunger and exhaustion, for to him life was Christ (Phil 1:21). Showing himself as a “rule of faith,” his example brought his people to a deep commitment to their own salvation. Being fully bilingual and bicultural, Father Jacob was uniquely blessed by God to care for the souls of his fellow Alaskans. When he arrived in Atka, the Church of St Nicholas had not yet been built. So, with his own hands Father Jacob constructed a large tent (Acts 18:3) in which he conducted the services. For Father Jacob the services of the Church were life: life for his people and life for himself. It was in the worship of God that he found both strength and joy. Later he would transport this tent with him on his missionary journeys, and like Moses in the wilderness, the grace of God was found wherever this tent was taken (Num 4:1 ff; 10:17 ff). When his first six months had ended (end of 1829), Father Jacob recorded that he had baptized 16, chrismated 442, married 53 couples, and buried 8. Once the church was constructed, Father Jacob turned his attention to the building of a school in which the children would learn to read and write both Russian and Unangan Aleut. The Russian American Company provided some of the support initially, with the students providing the remainder. This continued until 1841, when it was reorganized as a parish school and ties with the company ceased. Father Jacob proved to be a talented educator and translator whose students became distinguished Aleut leaders in the next generation. Father Netsvetov led an active physical and intellectual life, hunting and gathering for his own subsistence needs, preparing specimens of fish and marine animals for the natural history museums of Moscow and St Petersburg, corresponding with St Innocent (Veniaminov) on matters of linguistics and translations. He labored over the creation of an adequate alphabet for the Unangan-Aleut language, and the translation of the Holy Scriptures and other appropriate literature into that language. St Innocent praised the young pastor for his holiness of life, his teaching, and for continuing this work of translating which he, himself, had begun earlier among the native peoples. After fifteen years of service, Father Jacob was awarded the Nabedrennik, Kamilavka, and Gold Cross. Later, he would be made Archpriest and receive the Order of St Anna. These ecclesiastical awards do not tell of the personal sufferings of this warrior for Christ. In March of 1836, his precious wife, Anna, died of cancer; his home burned to the ground in July of 1836; and his dear father, Yegor, died of an undetermined illness in 1837. Who can utter the depth of sorrow felt by this God-pleaser? Yet he lifted up his voice with that ancient sufferer and cried, “shall we indeed accept good from God and shall we not accept adversity? In all this he did not sin with his lips” (Job 2:10). In his journal Father Jacob attributed all to “the Will of Him whose Providence and Will are inscrutable and whose actions toward men are incomprehensible.” He patiently endured hardships and sufferings like the Holy Apostle Paul. He saw in these misfortunes not a Victory by the hater of men’s souls (i.e. the devil) but a call from God to even greater spiritual struggles. With this in mind, Father Jacob petitioned his ruling bishop to return to Irkutsk in order to enter the monastic life. A year later, word reached him that permission was granted contingent upon the arrival of a replacement. None ever came. Instead, Bishop Innocent soon came to Atka and asked Father Jacob to accompany him on a voyage by ship to Kamchatka. Who can know the heavenly discourse enjoyed by these two lovers of Christ as they traveled over the waves? This, however, is clear, the holy archpastor was able to accomplish three things in Father Netsvetov. Firstly, he applied the healing salve of the Spirit with words of comfort; secondly, he dissuaded Father Jacob from entering the monastery; and thirdly, he revealed to the godly priest the true plan of the Savior for his life, that he ‘might preach (Christ) among the Gentiles” (Gal. 1: 16) deep in the Alaskan interior. Father Jacob continued to serve his far-flung flock of the Atka parish until December 30, 1844. A new zeal had taken hold of him, and it was then that St Innocent appointed him to head the new Kvikhpak Mission in order to bring the light of Christ to the people of the Yukon. Here, aided by two young Creole assistants, Innokentii Shayashnikov and Konstantin Lukin, together with his young nephew, Vasilii Netsvetov, Father Jacob “settled’ in the wilderness of Alaska. He learned new languages, embraced new peoples and cultures, devised another alphabet, built another church and Orthodox community, and for the next twenty years, until his health and eyesight failed, continued to be an evangelical beacon of the grace of God in southwestern Alaska. Establishing his headquarters in the Yup’ik Eskimo village of Ikogmiute (today’s ‘Russian Mission’) he traveled to native settlements hundreds of miles up and down Alaska’s longest river (the Yukon) as well as the Kuskokwim River region. At the insistence of Indian leaders, he traveled as far as the middle of the Innoko River baptizing hundreds of Indians from various, and often formerly hostile, tribes. “Behold how good and how pleasant it is for brethren to dwell together in unity” (Ps 133:1). He built the first Christian temple in this region, and dedicated it to the feast of the Elevation of the Holy Cross. Here Father Jacob, in spite of failing health, joyfully celebrated the Church’s cycle of services, including all of the services prescribed for Holy Week and Pascha. Finally, in 1863, the evil One, who “walks about like a roaring lion, seeking whom he may devour” (I Pet 5:8), sought one last time to get the better of the righteous one. So the devil, the father of lies, (John 8:44), inspired an assistant of Father Jacob to level spurious and slanderous charges against his master. This resulted in a summons to Sitka, issued by Bishop Peter. The godly pastor was quickly cleared of all charges, but due to his ever-worsening health, he remained in Sitka for his final year serving a Tlingit chapel. He died on July 26, 1864 at the age of 60 and was buried on the third day at the entry of the chapel. During his final missionary travels in the Kuskokwim/Yukon delta region, he had baptized 1,320 people—distinguishing himself as the evangelizer of the Yup’ik Eskimo and Athabascan Indian peoples. This brief history has recounted the basic chronology of the saint’s life and labors, but we must not neglect to relate his other deeds, that the light be not “hidden under a bushel” (Mt.5:15). In 184 1, Father Jacob encountered a group of women from his flock in Amlia who had fallen victim to certain demonic influences and teachings. Blaming himself for the seduction and fall of his spiritual children by the evil one, he informed the leader among them that he was going to pay them a visit. Upon arriving, he found one of the women paralyzed, semi-conscious and unable to speak. He ordered that she be removed to another house apart, and on the next day when this was accomplished, he lit the lampada before the icons of the beautiful corner, vested himself in his priestly epitrachilion (stole), sprinkled holy water throughout the room, and began the first prayers of exorcism. He then left. During the night he was notified that the woman had begun to speak but incoherently. He came immediately to her and performed a second exorcism. This time, she sprang out of her bed and stood next to the saint, joined her prayer to his, and accompanied them with prostrations. When the prayers were finished, Father Jacob again sprinkled her with holy water and gave her the precious cross to kiss. She regained full consciousness, a state of health and true reason—that is, even the false teachings of the evil spirits had no more part in her. Once in November of 1845, Father Jacob was preaching in the village of Kalskag, where the local chief was also the head shaman. He spoke for all of the villagers and resisted the Word of God forcefully. But the saint, calm and full of the Holy Spirit, continued to sow the seeds of right belief and piety. After many hours, the chief fell silent and finally came to believe. The villagers, in solidarity with their leader, also joyously expressed their belief in the Triune God and sought Holy Baptism. So it was that this apostolic man, this new Job, conducted himself during his earthly course. There are many other deeds and wonders which he performed, many known and many more known only to God. Few missionaries in history have had to endure the hardships which Father Jacob faced, yet he did so with patience and humility. His life of faith and piety are the legacy which he leaves to us, his spiritual children in America, and indeed to all Christians throughout the world.